This month, The Green Moms Carnival ponders "food matters". With Food, Inc. in the theaters and The Omnivore's Dilemma on my book shelf, I could wax on and on about food. About how the food industry has fattened us up, poisoned our water, and decimated the environment. About how switching to locally grown foods, produced without use of chemical fertilizers or pesticides on small, polyculture farms is a big part of the solution. About the Farm Bill or Victory Gardens or real food in our schools. Sometimes, though, there's so much to say that it's better to say nothing. To let pictures do the talking. Below are photos I and some of my blog mates have taken through out the country which demonstrate just how much food matters. Organic Swiss Chard at a Bay Area Farmers' Market. The keychain from a hotel in Dungeness Bay, Washington. Mural outside of a natural foods store in Marin County, California. 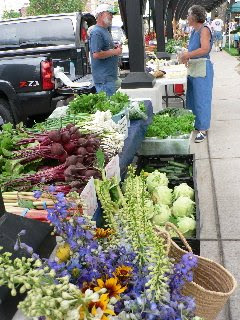 Farmer and customer meet at Cameron Park Farmers Market in La Crosse, Wisconsin. Getting ready for a parade in Point Reyes, California. Raised beds at a bison ranch in Utah. 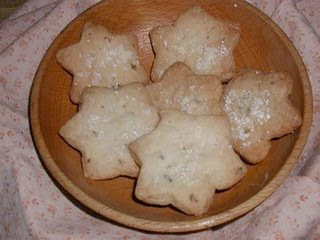 Home-baked lavender shortbread - made from homegrown lavender. Farmers' Markets are in season in Seattle, Washington. Sign in a restaurant in Sequim, Washington. 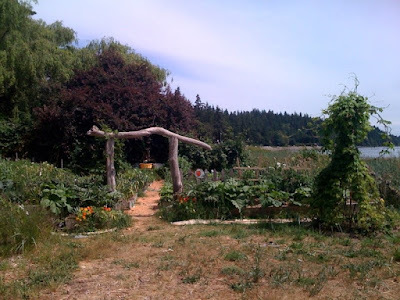 Victory Garden along the beach on Bainbridge Island, Washington. 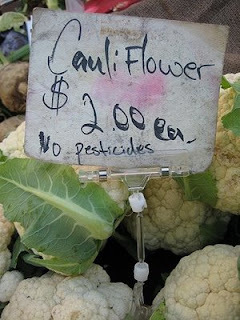 Pesticide-free Cauliflower at a Bay Area farmers' market. 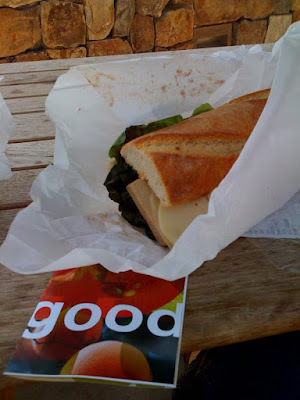 Sandwich from a "Slow Food" eatery in Palo Alto. The vegetable garden in my front yard. This month's Green Moms Carnival will be hosted by Alline over at Eco-Village Musings. Pop over there on Monday, July 13 to find out why the green mom-o-sphere thinks "Food Matters." I think I'm going to plant in my front yard next year - better sunlight. Hey, that's the Good Earth health food store in Fairfax with the painted mural (notice Vandana Shiva on the far left)! It's the only store I've seen that includes miles traveled on the produce price tags. And they're subsidizing the price of cloth produce bags for Sustainable Fairfax to move people away from plastic bags. They bake bread, blend smoothies, steam vegetables, sell local farm bouquets. And they're just nice to you. How fun to see pictures of places I recognize. Thank you. Thanks for the food matters photo tour! Where can I get a copy of that awesome slow food poster?? Ruchi: Funny!! My boys like both the purple and orange cauliflower. We usually do it straight up or in an omelet though the purple does make for some pretty soup - even if your youngest cries when you serve it to him. Joan: Go for it!! My front yard has MUCH better sunlight. I've got tomatoes planted in front and also in two different places in back. By far the ones in front are doing MUCH better. Katrina: That's the one. I was going to post some pictures of their mileage on food. Shoot, I guess I should have done that on this post. Time for an edit, I think . . . VERY cool store. Mindful Momma: Isn't that super cool. I have no idea but I have seen it as a button on some blogs. I love the changes sweeping the nation. It all looks so yummy. I'm in love with all my veggies right now. They all look so pretty. My garden is in my front yard as well. I don't have much of a backyard, and what there is, is pretty shaded. The front on the other hand, is big and sunny. That's where all my veggies, fruit trees and chickens are. Now I'm off to ogle the pickle crocks I just got. Can't wait to ferment some pickles and kim chi. Those are gorgeous pictures. I thought the kale was rhubarb at first! Did not know that mural was so close to me in Fairfax. I will have to check that place out!! Lynn! Different Fairfax! This one's thousands of miles from you. Love the photos. I finally got control of my blog back with a number of forced refreshes, but the picture was driving me nuts because I know it's not posted anywhere on my own blog! The Mom: Same with me - in terms of shade and sun. I don't think I could get away with chickens in my front yard though. How do you have yours set up. Lynn: Like Beth said. 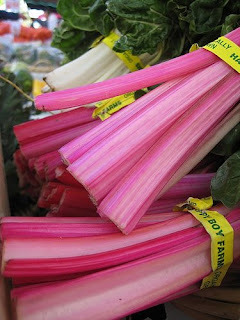 :) And the chard, we have our amazing regular guest poster/resident photog to thank for that!! Chile: That is really really strange!! I mean really really really. Made me miss Marin . . . 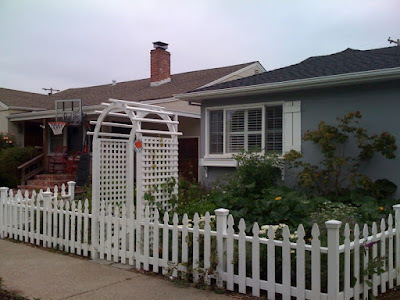 I grew up in San Anselmo . .
Love the pictures especially with the lavender cookies. What do they taste like and do you use fresh lavender to make them? Purple cauliflower? Does it throw off the cabbage worms? I just met an urban gardener who planted collard greens all along the sidewalk and proclaimed: "i plant that for everyone. anyone can come and pick collard greens if they want. i give that away for free." so friggin cool!!!! food is not only a health issue, but an economic justice issue as well. what a foodie malatov cocktail this man is throwing at the dysfunctional food system we have come to be manipulated by.